« 1066 and all that has landed! I enjoy gardening and nosing around other people’s gardens; my own is designed on Roman lines and I even have a Roman herb garden. I often mention gardens, plants and flowers in the Roma Nova books; Carina has the key to a walled garden full of figs, vines, myrtle and other aromatic plants. Several characters in Roma Nova are serious rose growers: Aurelia, Sylvia and Apollodorus – a very Roman trait. Ancient Romans loved their gardens (Latin: hortus) and ornamental horticulture became highly developed during much of the Roman period. In the earliest times gardens were a common way for the less wealthy Romans to grow food, mainly herbs and vegetables, for themselves and their families. Herbs not only seasoned food, they were important for medicinal and religious purposes. Growing family food continued even when ornamental gardens became much more fashionable but food production was relegated to a side or back area. Gardens were places of peace and tranquility, refuges from urban life and places filled with religious and symbolic meanings. The perfect place to entertain guests, relax and unwind. With conquest and trade, ideas and techniques from Greek, Egyptian, Italian and Persian gardens influenced Roman culture as villa and palace pleasure gardens, public parks and exercise gardens. Modified versions of Roman garden designs were adopted in Roman settlements in Africa, Gaul and Britannia. Formal gardens had existed in Egypt as early as 2800 BC to beautify the homes of the wealthy. Porticos were developed to connect the home with the outdoors, to create outdoor living spaces. (Nothing new under the sun!) Persian gardens were enclosed to protect from drought, and were rich and fertile in contrast to the dry and arid terrain. The peristyle garden derived from Greek influence; it was used to beautify temple groves and create recreational spaces and was adapted to a domestic scale as a town house inner courtyard garden. In Ancient Latium, a garden was part of every farm. According to Cato the Elder, every garden should be close to the house and should have flower beds and ornamental trees. Alexander the Great is credited with bringing back new varieties of fruits and plants from Western Asia which stimulated increased interest in horticulture. Horace wrote that during his time, flower gardens became a national indulgence. 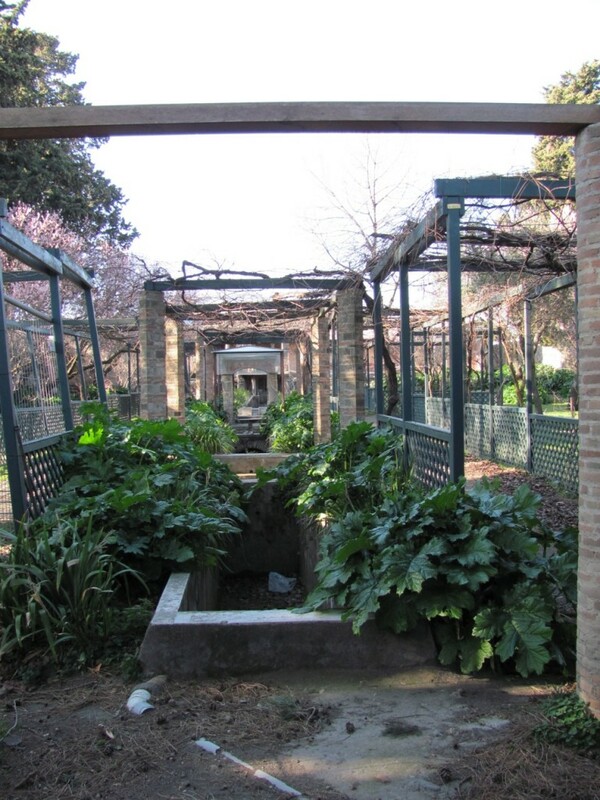 Augustus constructed the Porticus Liviae, a public garden on the Oppian Hill in Rome. Large villas and estates had much larger gardens laid out on a grand scale something copied by aristocrats from the Renaissance period over a thousand years later.Topiary, lakes, riding grounds, swimming pools, even water theatres as at Hadrian’s villa at Tivoli. But the country garden would also stay true to its origins in the simple hortus. Each garden maintained an olera or vegetable patch. But even these practical gardens evolved. By the first century AD, they were joined by hothouses for the forcing of grapes and melons. 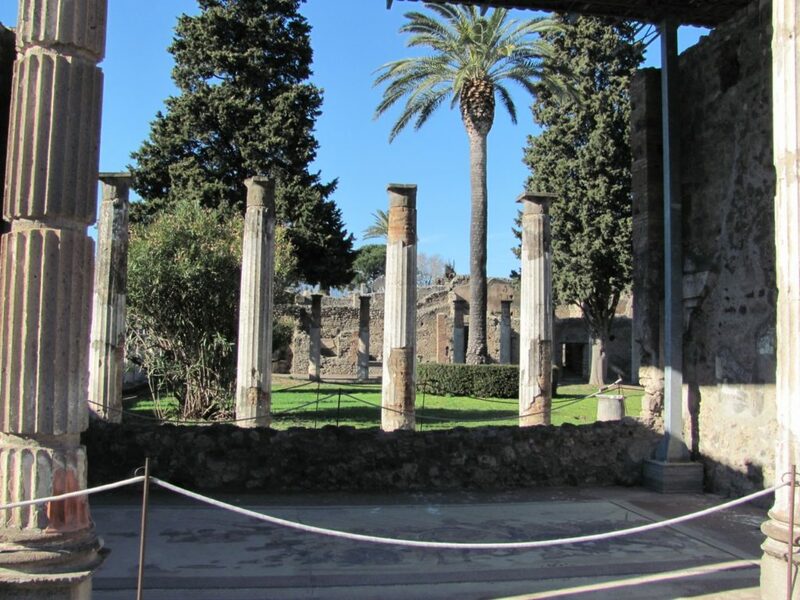 Excavations in Pompeii show that gardens attaching to residences were scaled down to meet the space constraints of the home of the average Roman. As town houses were replaced by tall insulae (apartment buildings), these urban gardens were replaced by window boxes or roof gardens. Roman gardens were generally separated into the same basic parts whatever the style or type of garden. A xystus lay at the centre of Roman gardens; a garden walk in front of porticoes and divided into flower beds with box borders. The xystus often overlooked a lower garden, or ambulation. The ambulation consisted of a variety of flowers, trees and other foliage and served as an ideal place for a leisurely stroll after a meal or conversation. Paths or walkways were often constructed of loose stone, gravel, sand or packed earth. Gardens featured many ornamental styles, from sculpture to frescoes to sundials depicting nature scenes or a shrine (aediculae) to the gods or other non-worldly creatures. A summer dining room – a triclinium – an open-air dining area attached to the house was often overhung with vines to provide shade. Pleasure gardens incorporated different designs depending on the taste of those who built them and generally consisted of a patio at the entrance, a terrace, an orchard or vineyard, several water features, a kitchen garden, shrines or grottoes and other decorations. The patio would normally be decorated with garden furniture, water basins/fountains and lead to walkways to other parts of the garden. Weather often played a decisive part in what went into the ground. 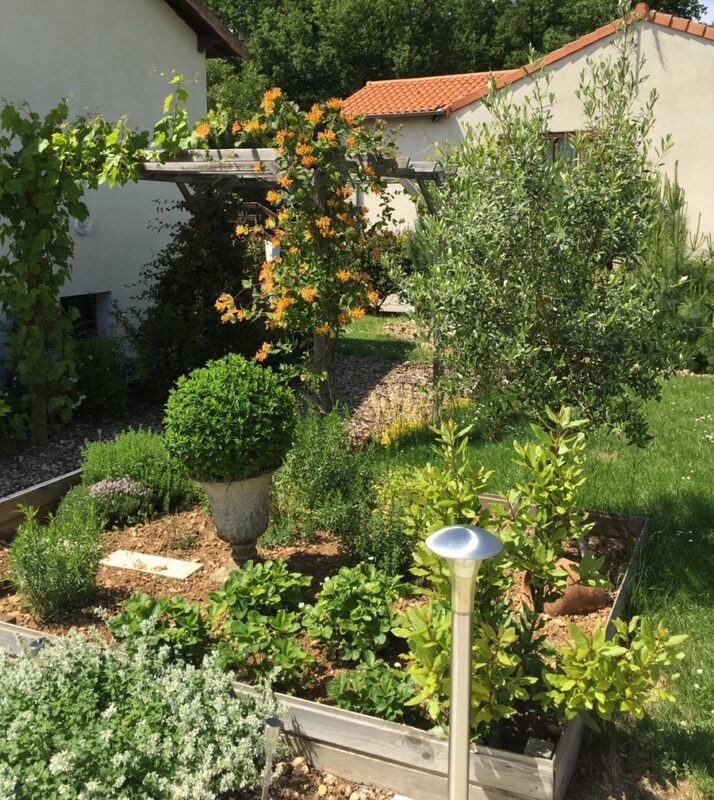 Planting ranged from flowering shrubs to herbs and vegetables for everyday use, and trees. Walkways and beds were often edged with box, sometimes cypresses and plane trees. The most popular plants found in the typical Roman family’s garden were roses, mulberry and fig trees along with a variety of dwarf trees, tall trees, marigolds, hyacinths, narcissi, oleanders, violets, saffron, cassia, lily, gladioli, iris, poppy, amaranth, acanthus. Favourite herbs included thyme mint, savory, celery seed, basil, bay, rosemary and hyssop. 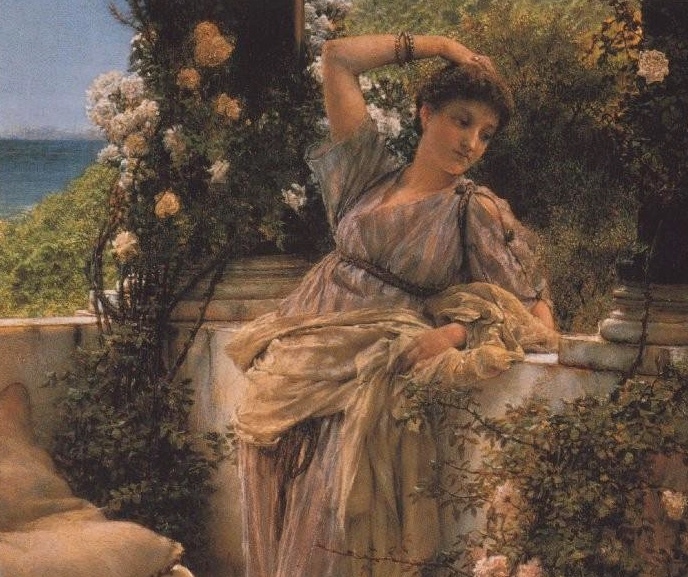 Almost all aristocrats in ancient Rome had rose gardens at their residences. Like the Greeks and Phoenicians, Romans not only cultivated roses but also traded them. They acquired the roses while they conquered and occupied and planted them in their old and new homes throughout the Empire. Consequently, roses spread rapidly and extensively throughout the Middle East and Mediterranean. During the Roman era, a repeat-blooming variant of the Damask rose evidently appeared, the first member of a group which came to be called “Damask Perpetuals.” The Romans were so sophisticated that they developed a hot-house technology which allowed them to ‘force’ roses into more bloom; they also imported roses from Egypt. Damasks, Albas and Gallicas dates from these most ancient times in Europe and the Mediterranean. What a lovely blogpost, Alison. I really enjoyed it. I know zilch about gardening but managed an A in OU when we did the 18th century garden! Obviously the theory comes easier than the practical to me with regard to gardens and gardening. Thanks, Fenella. and well done on your OU success. Pulling weeds and pruning plants is very therapeutic for a writer. I can recommend it. A really interesting and informative post! 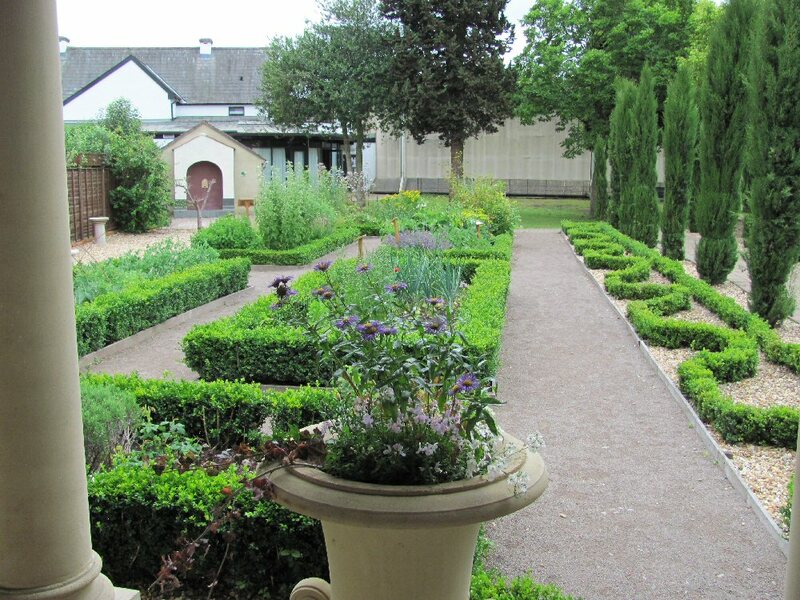 I thoroughly enjoyed reading about Roman gardens and how the style was influenced by those of other countries through trade relations – and how, in turn Roman-style gardens were adopted in countries around the Roman Empire. As for the old tools, I suppose nothing has changed much in that department, other than the introduction of mechanised machines. 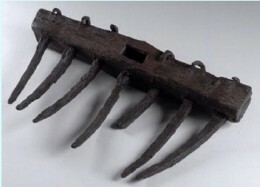 The Roman rake is a wonderful piece of evidence, too. I imagine the Roman ‘hothouse’ technology was similar to that of their central heating systems in general? Also interesting is the green walkways edged with box. That’s an idea that was used extensively in the English stately homes. A lovely post, Alison. Thank you. Thanks milliethom. We tend not to hear much about domestic aspects of Ancient Rome, just the battles and grand architecture. But it was an incredibly complex culture and gardens were an expression of its reach and creativity yet still bound up with food and symbolism. Beautiful pictures and a great reminder of the multi-facetted extent of Roman culture. Thanks, writerchristophfischer. Our connection with the soil whenever we are in history is one of the critical aspects of being human. But I’ve noticed that the more complex the civilisation, the more elaborate the gardens.